The two images on this page hold a key to understanding why it’s vital that you set-up your computer correctly when you’re processing color digital images. In this image, look at the center squares: the ones on both the upper face and the one closest to you. One is brown and the other yellow, right? You really can’t believe your eyes. Look again. You’re sure? Brown and yellow. Yes? 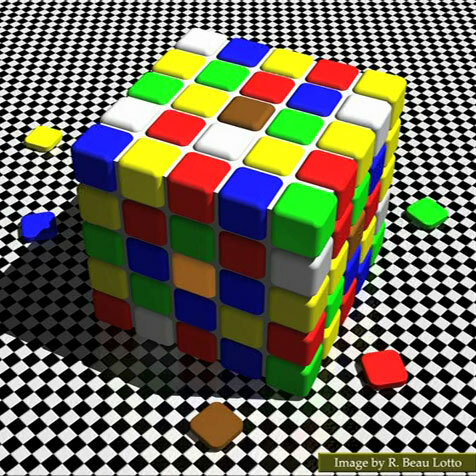 The yellow square is an optical illusion. Imagine that the area in which you process your color images has a color cast – from the lighting perhaps or maybe because of the color of your walls, ceiling, desk or bookcase. 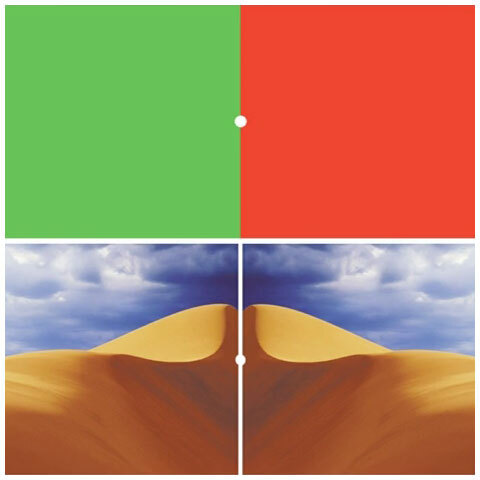 You now know why your image processing area must be color free and why your screen must be calibrated: the colors within your environment affect your eyes. Any color cast, or non-full spectrum daylight balanced light source, will make you see colors incorrectly. If your room/computer monitor has a color cast, the images that you color correct will, most likely, have a color cast of the complimentary color (eg a green environment will result in your images having a magenta cast when viewed in standard conditions). This is a ‘must see’ video for any photographer who wonders whether calibrating their monitors and setting up daylight illumination in their color working areas is worth the effort. I liken what’s happening to a RAW vs JPEG image: when the camera first grabs the image, it’s in the camera’s RAW format. That raw image data is transferred to a mini-computer that’s built-in to the camera which processes the data and converts it in to the JPEG standard. JPEG images have information removed from them. This makes it faster for them to be downloaded from the Internet. Although we don’t often notice the difference, a JPEG has less detail and color information than the RAW data. A JPEG image is different than a RAW image. A computer makes those changes and we don’t normally notice. What Beau Lotto is showing us in the video can be likened to this. The RAW image from our eyes is transferred to a computer (our brain) and processed. Based upon a specification derived from both genetic and experiential ‘programming’, some data is discarded; other data is changed/enhanced/simplified. What we ‘see’ (perceive) isn’t the image that fell upon our retina. What we perceive is the what is left once our brain has processed the raw image. Most of the time that’s fine. But sometimes our brain interprets the image in a manner that causes us problems … just like JPEGs do sometimes when we want to edit them. Please Share/Tweet for other photographers to see. Photographic Retouchers Can Be Heroes Too!